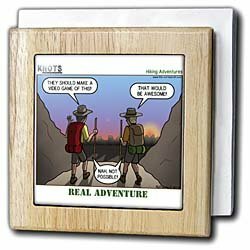 Knots Hiking Adventure - Real Adventure Tile Napkin Holder is measuring 6w x 6h x 4d. Made from high quality solid maple wood with satin finish and two 4.25 commercial grade mirror gloss ceramic tiles. Holds napkins, mail, letters or files. In addition, customized engraving, on the face of the item, is available on request.